When I met Philip, he had a big plastic jar that he kept all his change in. He estimated that the change in the money jar equaled about $50. I have never been much of a change keeper, but after we got married I converted and added my $3 (or something pathetically low) worth of coins to the jar, we upgraded to a larger plastic bin, and from then on we started keeping all our change. Since Philip works for a car rental company, he frequently washes cars where he runs across coins that people have left behind. This change goes in the change bin along with any other loose change we find in the house, in the car, or in my purse. Now that we’ve been married three and a half years, this plastic bin is filled with change – and not just pennies. We’re estimating several hundred dollars of change. Over the last few months we’ve been talking about buying a nice kitchen table to replace our tiny and cheap IKEA table. I suggested that we use this change. It may not cover the entire cost of a table and six chairs, but it will probably cover most of it. It is amazing to me that a quarter here and a nickel there, accumulated over a few years, will be able to make such a huge purchase. We rarely think about this money, and have never missed it, so it’s almost like having a huge chunk of free money to spend on something we would really like to buy! 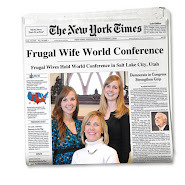 I’ve heard of others using their spare change to save for family vacations. Others, to buy cleaning supplies and other household necessities. Some use it up every month, and others save it for years. But any way that you look at it, it’s basically free money that allows you to make purchases that won’t take away from that month’s paycheck. And really, you can’t get much better than that. So readers, do you save your change? And if so, what do you use it for? My soon-to-be husband and I have been pooling our spare change for the last three years, and just turned it into cash the other day to put toward our honeymoon in June. In a world of debit cards, we rarely use cash and get coins, but occasionally it happens, and it ended up being $120 - that's a night in a hotel! 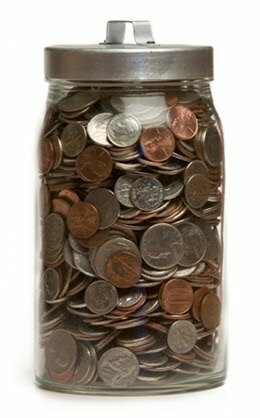 We're filling our jar right back up, and I'm considering going to cash more often - to lower my spending and save the change! Another great idea to start using!! I like!!! We always put our change in a plastic jar that has a coin counter on the top. I don't think the number is accurate any more because we use all the quarters in it for doing laundry. But we still have a lot of other coins in there and I'm sure it would add up! We save our change too. When my husband was taking the bus to and from work every day for a while, he just went to the change jar every morning for his fare. Now we might start using it for the kids allowance money. We haven't been saving ours for something big, we just use it here and there when we need some cash for something. A book club that I belong to also keeps a change jar. We put any loose pocket change that we have on us every month into the jar. At Christmas we then give the change jar to someone in need. I have heard of other families using their change jars for that purpose as well. My grandparents, parents, my husband and I, and my children save change. A few times when I was first married, this kept us from going hungry. When we were kids, my parents used the change to pay for our activities and school lunches. When we children were grown and had children of our own, my grandparents and parents would deposit the change equally in the grands savings accounts. The story has been told of President Hinckley's mother's habit of saving the change from every grocery store trip and that this is how he got the money for his mission. I don't use cash that often so I don't run across change a lot but we do have a little coin purse we collect our loose change in. Of course I save my change. Maybe this is another European-American difference (brought on by the fact that we our bills start at 5 euros, not 1), but here change is an integral part of your wallet, and not something to be thrown away. For practical reasons, my change is what pays for cups of coffee at the university, or church collections, drinks out with friends, incidental groceries..all the small amounts I end up spending over the week. I have a piggy bank shaped like Belle that I got from Disney World when I was in high school. Because I was an exclusively cash-user in high school, I had a lot of change. (I rarely have change now.) There were two times when I was completely broke and trying to figure out where I could get some money to last me until the next paycheck. Both times I was able to empty out Belle and get about $40. Life-saving. I bet she has about $15 these days because Eric always empties her of her quarters to do laundry. I just spent two days counting the change in my fiance's plastic pepsi bottle. There is more than $400 in it and I still have the pennies! I think saving change is a an excellent auto savings plan, especially if one uses money instead of cards. I remember going to the casino here in Vegas with my older sister, since she was 21 at the time, to cash in our change for free. We separated it before going and when we got there we'd dump it into their change cups. Now, it's all digital and just a receipt is printed out. I don't want to pay 9 cents for every dollar - if I did have $200 worth of change I'd lose $18(I think I did the math right...) just because I used the coin machine. So, after this long story that I probably didn't have to write... Where/How are you going cash in your change? Lindsay: I was planning to go to the bank and getting those paper coin sleeves. If you count it yourself, insert them into the sleeves, and then take them to the bank, they'll exchange it for bills for free. It might take me a couple days to do it, but it's something to keep my hands busy while I watch a movie or something. And then I don't lose nearly 10% of my change! which is free if you are planning on using it at one of the certificate locations. Anyone else have great ideas on how to count their change for free?? To cash in the coins, there are several options, some more laborious than others. I have seen Coinstar machines- you dump your money in and it counts it, prints out a reciept that you take to customer service for bills, but like Lindsay mentioned, it takes a percentage out. There are some banks participating in a similar method now. My bank (Chase) has one of those machines in their lobby, and if you have an account with them you can use it free of charge. Basically, you take in your bucket 'O coins and dump it in. It counts it, prints out a reciept with the total on it, you take it to the counter, and they give you cash. Much easier than rolling it! I think there are other banks doing this now, as well. My brother-in-law had a big ol' Sparklettes bottle from the time he was a little guy that he would contribute coins to when he could. I'm talking, like 5 years old here. He was saving money at that age for his wife's wedding ring. And I kid you not, when he and my sister got engaged, he pulled out that mother bottle and paid for her ring with coins (I mean, he probably exchanged it for cash, but you get the idea). We really want to pay off our mortgage as soon as possible (we've owned the house for one year), so once a month or so I take the coins to the bank (ours will count them in their machine for free), and apply the amount to the mortgage principle. It also helps that I am a part-time waitress, so I keep my change instead of "trading up" at the register every day. Becca-- I love the engagement ring story! My Aunt had a large water jug in her bedroom that she and her husband always deposited all of their leftover change from their pockets & purse into every night. After a few years that paid for plane tickets for 4 to Disneyworld! She made a believer out of me! !